Libby Gleeson AM has published over 40 popular, highly acclaimed books for children and teenagers, been shortlisted for 17 CBCA Awards, and won five. Libby has been a teacher and lecturer and contributes regularly to national conferences. She chaired the Australian Society of Authors from 1999-2001, and in 2007 was awarded membership to the Order of Australia. She won the 2011 Dromkeen Medal, awarded for contributions to children's literature. Freya Blackwood grew up in Orange, NSW. The daughter of a painter and an architect, she began drawing at a young age. She has collaborated with many wonderful authors, including Libby Gleeson, Margaret Wild, Jan Ormerod, Roddy Doyle and Nick Bland. In 2010, Freya won the prestigious Kate Greenaway Medal for Harry and Hopper, and her books have been honoured in the Children's Book Council of Australia Book of the Year Awards many times. It’s a rainy day and the gloom matches Cleo’s mood. She’s lonely and bored and is amusing herself by counting the raindrops sliding down the window pane. Intent on counting to a zillion, she only interrupts her task when it is lunchtime. By the time she has finished the rain has almost stopped so that puts an end to that and with all her friends otherwise occupied it looks like it is going to be a l-o-n-g afternoon. Her mother suggests she clean her room and although that doesn’t appeal, something she spies on her way to do it, does. But once again Cleo gets into strife. However every cloud has a silver lining and while Cleo is scrubbing her hands to get the mascara off she sees her reflection in a puddle and that gives her an idea… and she finds a friend! In the second story in the book, Cleo has fallen in love with her friend Nick’s new puppy, Peanut. She would desperately like a puppy too but dad is adamant that that won’t be happening because of the cost and the amount of looking after they need. Even when the puppy pees on her dress her determination remains and she tries the age-old art of pester power, but still to no avail. Even loving Uncle Tom can’t help her this time and she is even more despondent when the children at school talk about their pets and she has nothing to say. But after an altercation with her dad about the snails in the garden, she has an idea… and gets a pet that costs nothing and is easy to look after. 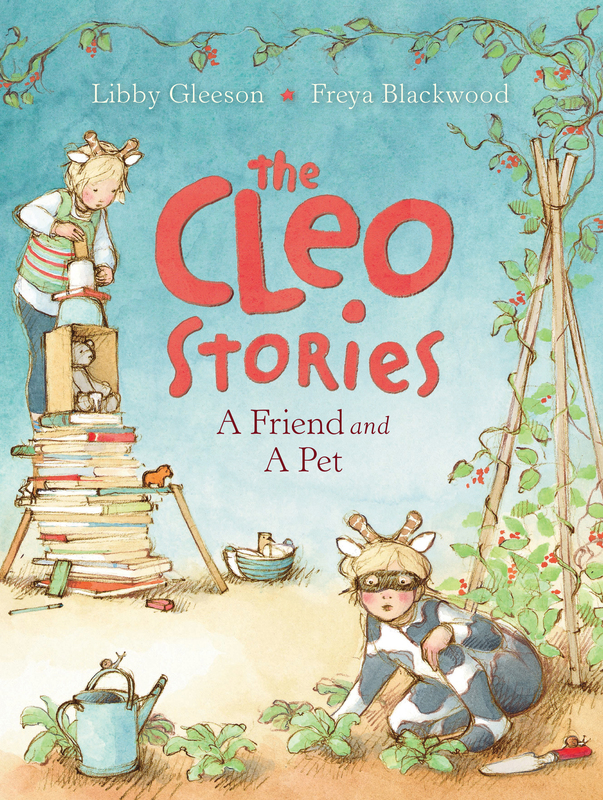 Readers first met free-spirited Cleopatra Miranda McCann in the first book The Cleo Stories: The Necklace and The Present which won the CBCA Book of the Year Award for Younger Readers in 2015 so they will be delighted that she is back with all her imagination and determination to seek solutions to her problems. Gleeson has a knack of writing about events that will resonate with her target audience and Blackwood’s illustrations, based on her own daughter, contain much to explore while complementing the text perfectly. Newly independent readers, particularly girls, will be very happy to make Cleo’s acquaintance again and learn from her.